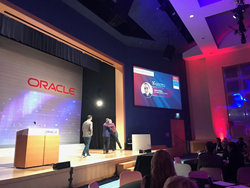 Architecture transformation specialist Cintra has won the MSP Pioneer award at the 2018 Oracle PartnerNetwork’s Outstanding Partner Teammate awards in North America. This award recognizes Cintra’s successful delivery of a complex, business-critical cloud transformation at a large global enterprise, under an Oracle MSP contract. The program saw Cintra move and improve key business systems to the Oracle OCI Cloud, using the Cintra RapidCloud methodology to deliver a working production system in just 90 days. As a result of Cintra’s work, the customer has been able to reduce its legacy on-premises footprint and significantly improve performance and services levels around the now cloud-based systems. Cintra is one of only a small number of organizations on Oracle’s highly prestigious Global Cloud Managed Services Provider (MSP) program. Steve Wyper, Vice President of Sales at Cintra, said: “We’re delighted to be recognized by Oracle as a pioneer in the cloud MSP space. We have invested a lot in our RapidCloud transformation methodology, and projects like this one show just how quickly we can take our customers’ strategic enterprise applications to the Oracle Cloud.